2015 was such an awesome NRL season that I’m still writing about it (plus I’ve been pretty busy with a million other things (including the Cricket) so there’s that). As previously mentioned, I’m breaking this Trimester Report into 4 bite size chunks for easy consumption. Part 1 was a few weeks ago and covered teams that finished 13th to 16th. In Part 2 we covered teams that finished 9th to 12th. This week we cover teams finishing 4th to 8th. Some are good news stories. Others underachieved. As always, we are in reverse skating direction. The Dragons didn’t exactly limp into the Finals but they certainly weren’t galloping. Solid losses to the Storm, the Rabbitohs and the Broncos probably were a better gauge than the big win against the Warriors (who were deplorable without Shaun Johnson) and although their attack improved immeasurably in the Final Trimester, it inversely correlated with their defence which went backwards in a hurry. Consequently, they were treading water come Finals time. Given they missed the Finals for 3 consecutive prior years, that was a significant uptick in their fortunes. Benji Marshall – The form of Benji Marshall definitely mirrored the form of the Dragons this year and the Final Trimester was certainly better than the middle part of the season for both. Marshall showed he wasn’t washed up like some were predicting. His off-the-cuff playing style and his combination with Gareth Widdop and Josh Dugan certainly contributed to their top 8 finish. Missed by a fair bit on this one. Probably underrated the impact that Paul McGregor had on the team. Also underrated their defence in the first half of the year and the strength of their forward pack. They looked undersized but they used their mobility to their advantage. Top 8 was definitely better than I thought they would do. Still looking under powered in the forwards (with the exception of Mike Cooper) although Mose Masoe and Russell Packer (if he can get on the field) are a step in the right direction. Kurt Mann is an astute buy which will contribute to an above average back line anchored by Gareth Widdop, Benji Marshall and Josh Dugan, although eventually Benji must see some diminution in speed plus he will have to bounce back from that horrendous Greg Eastwood tackle. Paul McGregor seems to have found his feet as a coach and I’m interested to see what strides the Dragons can make with another pre-season under him. I don’t know if they can replicate that top 8 finish but I certainly won’t be picking them to finish 15th again. If I could sum up the Bunnies year it would be that they lost some key players (Burgess and Te’o), Inglis didn’t seem right all season (injury I suspect), everyone was gunning for them and they didn’t make the necessary adjustments. Their round 23 win against the Cowboys was a false dawn and they entered the Finals on the back of 3 consecutive losses to the Bulldogs, the Broncos and the Roosters. The loss against the Roosters was particularly comprehensive (30-0). Probably the most disappointing thing about their season was there was no Plan B. Their adherence to structure was commendable but when 5 rucks and a set play isn’t doing it for you, chances are you need to reach into your back pocket and pull out Plan B. No Plan B ever materialised. George Burgess – Probably turned in more of a workhorse season in the absence of brother Sam than he would have liked but was still the best player from Souths by a fair margin. The Final Trimester was no exception. I thought they would top the ladder and then stumble during the Final series but their stumbling started much earlier than that. They hovered around the top 8 all season but never really found their groove. There are still a fair few unknowns around the Rabbitohs for 2016. It is assumed that eventually the NRL will register the contract of Sam Burgess but how many players that they will unload is yet to be determined. We know Isaac Luke is gone and he is a massive loss somewhat offset by Damien Cook who was greatly improved last season. Glenn Stewart is gone but it didn’t seem that the Rabbitohs worked out how to use his talents. Dylan Walker is gone and Chris McQueen and Chris Grevsmuhl are apparently being shopped as we speak. 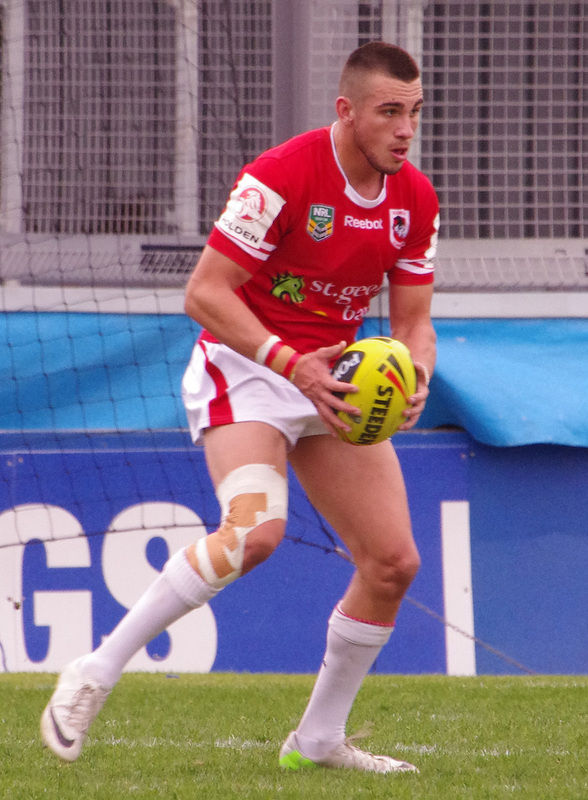 Tom Burgess is trialling for the NFL. At the end of the day the knowns are that Souths has a massive pack (again). They have 4 above average ball players in Adam Reynolds, Luke Keary, John Sutton and Greg Inglis with Inglis and Sutton doubling as strike weapons. If their ball players can all return to form then Souths will again be vying for a premiership. It would help if Michael Maguire had a Plan B too. Kept expecting the Sharks to fall over during the entire season but apart from starting the season with 4 losses they were amazingly resilient. They played that annoying grafting type of game that the Bulldogs are famous for. Probably no great surprise given Michael Ennis was helping to steer them around the paddock. Consequently, they were in nearly every contest and they gave some of the top sides fits including beating the Cowboys and Roosters twice during the year. The Final Trimester was no exception as they toughed out their way to a 6-2 record with only the loss against the Storm being comprehensive. Michael Ennis – Imbued the Sharks with a competitive edge to nicely complement the skill set in the team, Ennis really led from the front. Earned himself another State of Origin jersey as a late call up for Robbie Farah which was as richly deserved as it was unexpected. I thought the Sharks would be better but not this much better. We knew Paul Gallen would be the player he always is and we knew Andrew Fifita would continue to make an impact but no-one predicted that Jack Bird would burst on to the scene like he did. Likewise, no-one saw Michael Ennis roaring back to top form. The Sharks certainly looked to get the raw end of the deal when they swapped Ennis for Michael Lichaa, and in the long term Lichaa will certainly become a special player, but this year the Sharks get the points in that one. Luke Lewis kept defying the odds as well to continue as an edge weapon. The Sharks have recruited well for 2016 shoring up a perceived area of weakness in the halves. They now boast a spine of Michael Ennis, Chad Townsend, James Maloney and Jack Bird which is probably the missing piece for them. They already have the forward pack in place with Andrew Fifita, Paul Gallen, Luke Lewis and Wade Graham giving them plenty of grunt and skill to go along with it. Will Ben Barba finally return to his electric best? Nobody knows. He could be the X-Factor off the bench they need. They could push for top 4 next season. The Bulldogs definitely finished the Final Trimester with a flurry, winning their last 5 games in a row and looked well set for the Finals, although narrow wins against the Warriors and Knights were nothing to write home about. Moses Mbye permanently displaced Josh Reynolds in the halves and Damien Cook ably deputised for the injured Michael Lichaa at the back end of the Final Trimester. Curtis Rona (22) engaged in a week by week battle with Semi Radradra (24) for the Try Scoring Title, ultimately falling short but earning a spot on the NZ tour of the UK none-the-less. Frank Pritchard wound back the clock with some vintage play as well. That helped. 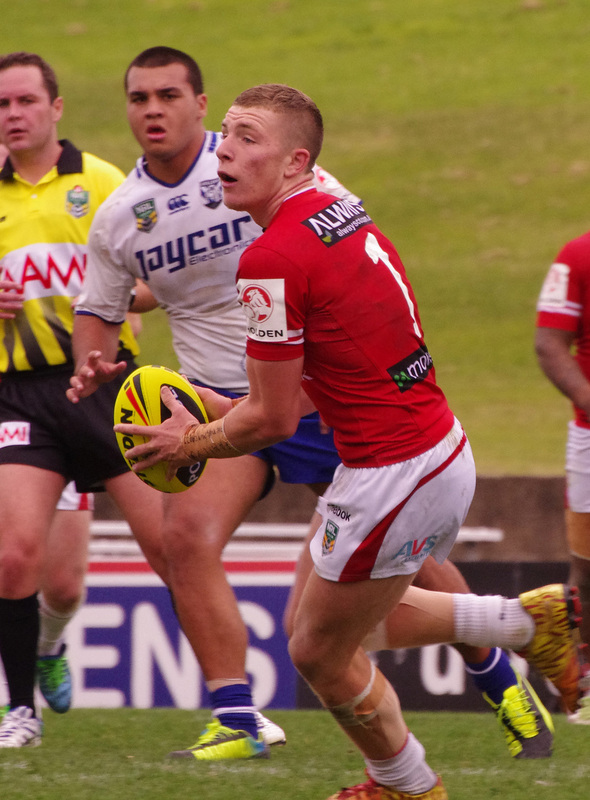 Damian Cook – This is partly due to his form in the Finals, however, he was a breath of fresh air. Stuck behind Michael Lichaa all year he finally got his chance and took it with both hands securing a contract with the Bunnies in 2016. He is old school tough. I thought the Bulldogs would be good but not great and that played out. I thought they overachieved getting to the GF in 2014. They were on a roll at just the right time and the draw opened up for them. 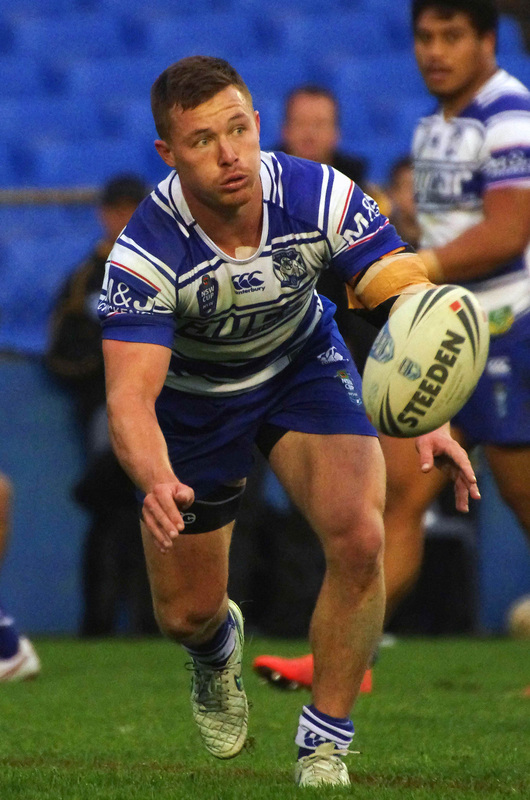 A lot of their ball play revolves around James Graham and he was missing for a large chunk of the season due to suspension. Their halves never quite got going either. Josh Reynolds and Trent Hodkinson started the season very slowly and Moses Mbye eventually displaced Reynolds in the halves. Brett Morris was a handy addition and provided additional strike power from Fullback but he was out injured for a fair while. A good but not great season. Des Hasler is one of the better coaches in the competition but I don’t know about the recruitment strategy. Frank Pritchard is nearing the end of his career but he was one of their best players last season. Damien Cook was behind Michael Lichaa so that also made sense. It seemed that Trent Hodkinson and Moses Mbye were the preferred halves at the end of the season so letting Hodkinson go didn’t seem to make any sense. Will Hopoate might be an inspired signing but he didn’t recapture his pre-Mormon mission form at Parramatta despite being there for 2 years. Hasler was his coach at Manly during 2010 and 2011 so he might be able to get the best out of Hopoate but maybe it was playing outside DCE, Kieran Foran, Glenn Stewart and Jamie Lyon that was the catalyst for his good form. Plenty of unanswered questions. I do like the signing of Brad Abbey though. He was a revelation in the Holden Cup and I realise that the Warriors can’t hold on to everyone but his similarities to Greg Inglis are uncanny. That might come back to bite them on the bottom. The Golden State Warriors. Still playing otherworldly Basketball. 23-0 now and breaking records of all descriptions. Hindsight is a wonderful thing but I bet they regret that now.